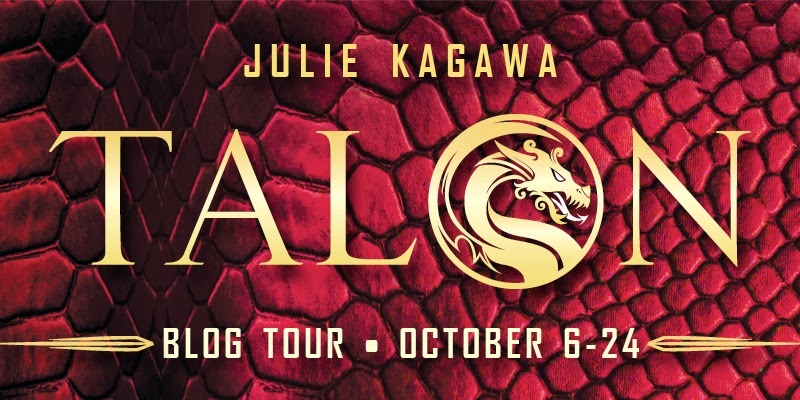 Welcome to the meet the character blog tour for the much anticipated Talon by Julie Kagawa. We are SUPER excited to be introducing you to this dashing fellow to our left His name is Tristan and he’s a member of the Order of St. George. He’s a bit snarky, he like’s his weapons and he likes to have a little bit of fun on his down time. We got a chance to do a little “speed dating” Q&A with him, it brought out his, well lets just say frisky side. We had a blast, and we hope you enjoy getting to know him a bit better before you check out Talon. But before we get to the Q&A, I guess I should say that I’m a little bias towards this gun toting hottie, he’s been mine for the last 4 years or so, I just didn’t know what form he’d take, but I love every snarkie inch of him! 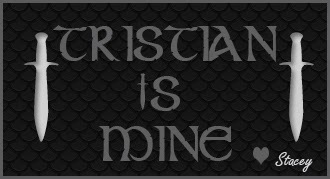 So, when it comes down to a fight on twitter about who owns who, I have dibs over all y’all, just sayin’. Tristan: My Barrett M107A1 .50 caliber rifle. 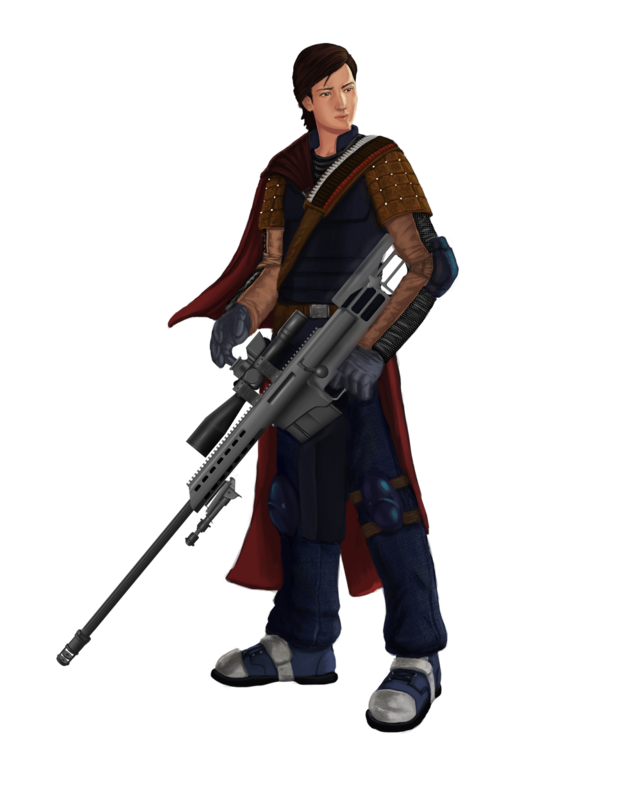 Uh, that’s a high powered sniper rifle for those who don’t speak Gun. I think you’ve confused me with my partner, Garret. He’s the bookworm. If I’m reading anything, it’s usually Gunman Monthly. Would you rather fight with sarcasm or a physical weapon of your choice? Well, that depends. If it’s just some random moron who doesn’t have a clue, sarcasm has always been my friend. If it’s a rampaging dragon trying to eat me, sarcasm isn’t quite as effective as a nice slug between the eyes. Brunette. Wait, that wasn’t the question? Oh, chocolate I guess. What’s the age group of your audience? Teens and young adults, you say? Uh, yeah. Let’s go with knitting. I love to…knit. Nice, safe knitting, yeah. Coffee. It’s a lifesaver after a hard night of…knitting. Besides myself? I guess that would be my partner, Garret. Though don’t tell him that. Wouldn’t want it going to his head. France. The coffee there is the best, and the views aren’t bad, either. Which character in Talon has you most intrigued? Harlequin, Julie and Kismet Book Tours have created some fun ways for you to win some awesome prizes! 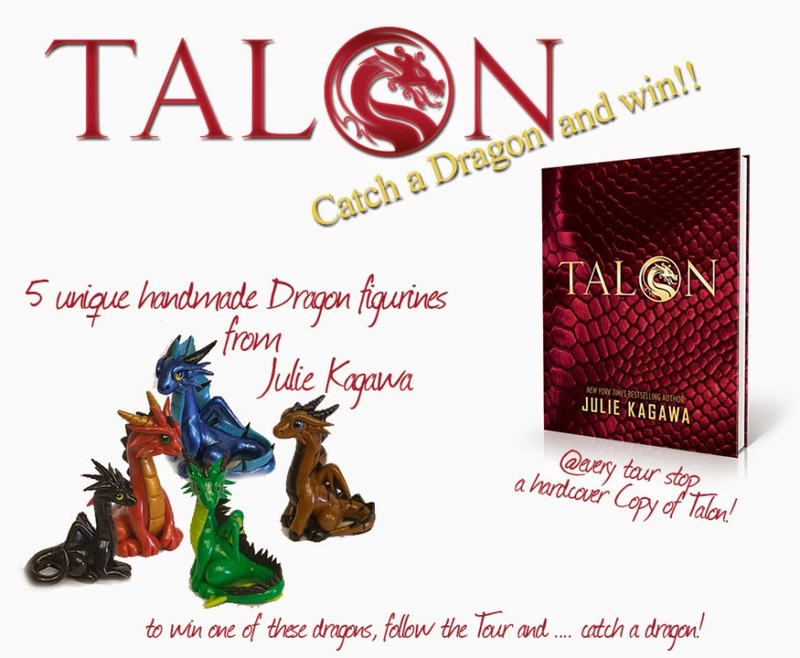 The first way to win is to use the Rafflecopter widget below to enter our daily prize to win a finished copy of Talon! The second way to win is by trying to catch the dragon! Mondays, Wednesdays and Fridays, a dragon will appear on a different blog and stay there for 48hrs. 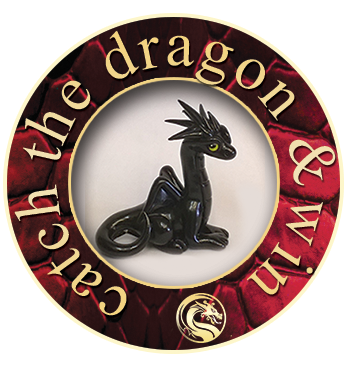 Once you have found the dragon, click on it and you will be directed to a Rafflecopter entry form for the Grand Prize (see pic to the left) Giveaway! To enter, you must answer the daily question found at the tour stop!!! So there, you go, two ways to win, happy hunting and be sure to read all the rules and terms and conditions on the rafflecopter widget, These giveaways are NOT being hosted by PTB and other rules will apply. Ember and her brother Dante definitely have me the most intrigued so far, y'know being dragons and all! I can't wait to read Talon!!!!!!! I think Ember because she really is going to be giving up all that she wants to experience. Utterly excited to read this book!!! Eep! AHH, I need this book! I love dragons, always have, always will! I really want to win! I am eager to read about Ember! Love all of Julie's books. I know that this one will be good too! I really can't wait for this book to come out! It's definitely one of my most anticipated novels of the year! Julie Kagawa's goal is to write about every subject she can think of, isn't it? So glad she picked dragons this time! I want to read this one so bad! I've loved Julie Kagawa since I first read one of her books. Also, I tagged you in the Chocolate Book Tag. Check mine out HERE. Ember, Garret, Tristan, Dante! All sound like interesting characters! Can't wait! Answer to question: Tristan! With Garret and his sister, Ember, close 2nds! Can't wait to read! I love dragon tales and can't wait to read Talon! It's going to be epic! LOVE the cover! I read the first two chapters and the one that I most looking forward to learning more about is Gorgeous Biker Boy. Thank you so much for sharing this!! Thanks for the giveaway. This book sounds exciting! It's Garrett. After he spent his whole life in killing dragons, he finds out that everything that he was taught, were wrong about dragons. I'm looking forward to reading about Ember! I am super excited about reading Talon. I have read and loved everything Julie Kagawa has ever written. Talon is such to me an epic read! Ember has me most intrigued. Maybe it's because she's the main character in the story but I'm excited read about her experience/ journey in the book! Love her books! Plus I LOVE dragons!